About an hour ago, Kate and I returned from lunch at Bluefish. For the past several months we have had our Saturday lunch there. It is several cuts above our routine places. Beyond the quality of the food (Kate always gets scallops with sautéed vegetables and sweet potato fries, and I get various things. I had my favorite today, Andouille sausage and shrimp stew and a special house salad that I love. ), I find that it makes for a relaxing ride to and from the restaurant. It is a full 25 minutes each way. That seemed especially appropriate today. Kate got to bed a little later last night (shortly after 9:00). Consequently, she slept later than usual. She wasn’t ready to go to Panera until 10:45. I had to help her find some clothes. She was quite groggy. We stayed at Panera for an hour before she was ready to go. (Over the past few weeks she has not wanted to continue in one place for long. The exception would be that she can stay outside a good while when the weather cooperates.) I asked if she were ready for lunch, and she nodded. Then we headed to Bluefish. She was quiet at the restaurant, something that is not unusual. After the meal, however, we chatted a bit in a real conversation which is rare. The funny thing is that the conversation began with a strange comment from Kate. Out of the blue she said, “Now, let’s see what else you can blame on Dr. Pepper.” I said, “You think I blame Dr. Pepper for things?” She gave me a look that meant, “Are you kidding?” Then she went on to say that I don’t blame anything else; it’s always Dr. Pepper. I didn’t push her to explain as I knew that she was simply imagining that I discourage her from drinking her favorite beverage. I suspect this is something that has been on her mind for a while. The only other thing I had noticed is that occasionally she asks, “Is it all right if I have a Dr. Pepper?” I always say yes. From this point, however, we started to talk about how different we are but how well things have worked out for us. We talked about the fact that we had been able to overlook the things on which we differ because of the important things we share. We also had a nice conversation with our server. I had asked her how she compared the quality of Bluefish with other restaurants around town. She gave me a good answer. I mean by that she was able to tell me how it stacks up in her mind compared to a number of other restaurants with which we are familiar. It confirmed what I hoped; she thinks it is a cut above most restaurants but not quite as good as several others. Kate and I believe it is unusually good. What had started as a slow day had now turned into one of those special moments that makes a day successful. We left the restaurant feeling good. I think that experience will set the tone for the balance of the day. I feel especially confident because she stayed outside pruning for an hour after we returned from lunch. That is one of the most therapeutic things she does. Something else that is becoming commonplace is closing doors to the bedrooms and bathrooms before we leave the house. I’ve never said a word to her about doing this, but I suspect that is something else that she believes I have told her she should do. 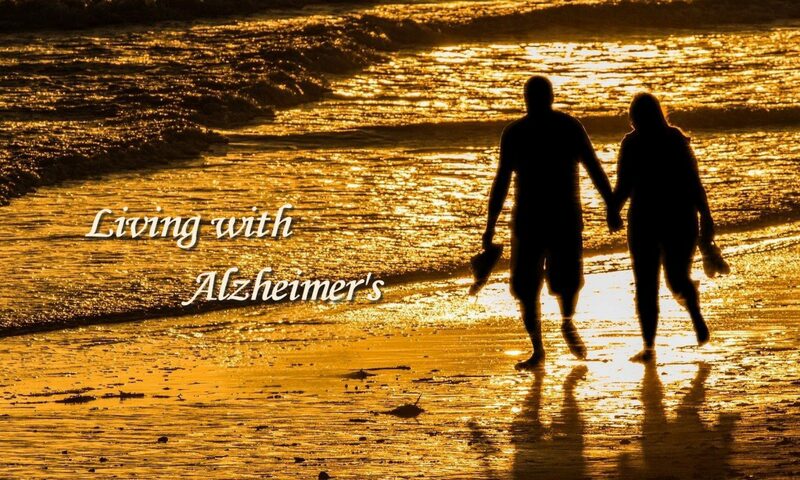 This is just another reminder of the many things that a person with Alzheimer’s will do apart from the more typical memory issues. Two or three times this afternoon and evening Kate has asked my permission to do something. One of those occurred when we returned from dinner. As she got out of the car, she noticed her Yeti coffee cup on top of our garbage bin. She looked at me and said with the inflection of a question mark, “I’m going to take this inside.” I said, “That is fine.” Before getting in bed, she asked, “Can I take off my shoes?” The other occurred this afternoon when she asked me if she could work on her album after getting home from lunch. Again I told her that was fine. I realize that telling her something is fine is itself reinforcing her behavior. I really don’t want to do that. On the other hand, I haven’t wanted to question her as to why she would ask me because she seems so sensitive about my asking her why she does things. She doesn’t know herself. Despite her objections that I am trying to control too much of her life, it is interesting that Kate is increasingly asking if it is all right for her to do things. Two examples occurred at dinner this evening. After ordering, she asked me if she could start “my album tomorrow.” I told her that would be good. Then I asked if she were talking about her Chautauqua album. She said yes. After dinner, she pointed to the parsley that she had taken from her plate and placed on a paper napkin on the table. Without using words, she was asking if she should take the parsley home for her compost. That is what she always does. Why she happened to ask about doing that tonight I can’t imagine. I told her that she could take it if she wanted to. She said something like, “I don’t have to.” She brought it with her when we left. When we got home, we both sat in the family room where I watched the news on PBS while she worked puzzles on her iPad. When it was almost 8:00, I told her I was going to take my shower. She decided to go into the bedroom. She sat down on the bed and pointed to the charging cable for her iPad. She didn’t say anything. I didn’t understand what she meant but said, “Yes.” When I said that, she reached down to disconnect the cable from the surge protector. Then I asked what she was going to do. She asked me what I wanted her to do. I told her she could leave it plugged in, that we were “not going anywhere now.” Then she said, “What am I going to do now?” I told her that it was getting near the time she would go to bed and that she might put on her night clothes. She indicated she would do that. Then she picked up her iPad and started to work on it in bed. After my shower, she was still in her clothes. I walked over to her side of the bed. She pointed to the sweater she was wearing. Then she said, “This or my night clothes?” I said, “Your night clothes.” In a few minutes, she got up and changed. Just another illustration of using minimal words and asking for my guidance even though she still wants to be very independent. Yesterday afternoon, Kate and I were talking about some of our memories when I suggested that we start a project of writing down our memories from our life together. She liked the idea. This afternoon she had reached a point when she was ready for a change. We had been to Panera this morning. Then we had lunch. When we got home, she pruned in the yard. Then she had worked on her iPad for a while. I could tell she was getting bored. Instead of asking if she would like me to take her to Panera, I asked if she would like to work on our memory project. She liked the idea and suggested we do it at Panera. We did it. She told me from the start that she would have to depend on my memory. I suggested we try to write down how we met and something about our first date. Then we started a second section on places we have lived. We only addressed the first place in Fort Worth. I could see she was getting tired and suggested we stop. I told her that I didn’t want us to think of this as work, that we would not have to work on it every day, just as we felt we wanted to. This first effort was better than I might have predicted. Jesse worked on the preparation of a cheesecake for our dessert tomorrow and a shrimp salad she was preparing for a drop-in at her neighbor’s across the street. We all went to lunch at the old train station there. It was a delightful ride over and back with a lunch that was quite good. On the way to Lowe’s she asked me if I had said something to Sylvia about our moving to Texas. I didn’t know who she was talking about and asked if she meant Sylvia Bailey, our daughter’s mother-in-law. It turns out Kate was talking about our decorator whom we had seen at Panera while we were there. Kate noticed how puzzled I was and said, “Never mind.” I didn’t say anything more. It was as if she suddenly realized that she may have imagined this conversation. As I have noted in earlier posts, this is something that occurs periodically. We had a couple of nice social encounters yesterday and today. The first was at Panera’s where we had lunch yesterday. A Rotary friend came in for lunch just as we were finishing up. He sat down beside us. That led to a conversation that lasted a little more than an hour. He is a funny guy and as a native Tennessean and former news broadcaster, he knows a lot of things that are happening around the state. Kate did not participate much, but she really enjoyed listening to the two of us. The second experience was tonight at dinner at our favorite Mexican restaurant where I always speak Spanish with the servers. I engaged in conversation with one of them about how it seems like such a short time since we were there just before Christmas a year ago. After we finished the conversation, Kate said something like, “I would have married you just to hear a conversation like that.” She went on to explain that it was such a natural conversation between two people from such different worlds with no sense of any distance between us at all. I try to tell my friends that we don’t eat out just for food. It is an opportunity for significant social encounters. This is often the case. I just remembered something else that occurred yesterday. We were driving to dinner when I said, “I haven’t seen Mark in a while. I think I will call him for coffee tomorrow afternoon.” She replied in a soft voice, “What am I going to do?” I felt so sad for her. She has such a strong need for activity other than what I am providing. It is so difficult to accomplish. I have mentioned to virtually everybody who asks about her that she is socially isolated. Several people have indicated a desire to help and would enjoy getting together. Only three people have actually responded. Two of them got together with Kate and me for lunch with no follow up. The third got together with the two of us twice. I believe she is likely to follow up again, but she is a school teacher and has obligations during the school year. I really do understand. All of us seem to be so busy that we can’t work in many extras like visiting someone who may be in need. Last night on the way back from dinner, she looked at the clock in the car to see that it was only 6:00 p.m. Then she said, “What am I going to do?” She went on to say she can’t just work puzzles all the time which is what she is doing. This is so painful to me as I am working so hard to keep her active, but my efforts are never enough. Last week I also mentioned Kate’s isolation to our associate pastor for congregational care. I asked her about others in the congregation who might want to establish a connection. I also left a phone message for Don Crawford whose wife has AD. I saw him at church on Sunday, and he asked me to call back. I would love for Kate and his wife, Cynthia, to get together. I am going to be hopeful. Kate does drink a lot of tea and Dr. Pepper. That would be the next step to try. That will be a hard one as these are long-standing habits. Kate was working on her iPad while Forest Gump was playing on TV. I thought she might get interested, but once again I was wrong. She is simply losing interest in watching things on TV. At 9:00, she said, “That’s it.” She put her iPad down on the bed, but she didn’t take any steps to get ready for bed. After a few minutes, I asked her if she was ready for bed or if she wanted to keep watching the movie. At first, she didn’t answer. Then she asked, “What do you want me to do?” I told her it was 9:00, and that it was about time to prepare for bed. She got up and went to her room. I went into the family room to listen to music before retiring for the evening. About 10 minutes later, I got up to see if she had gone to bed. She was coming into the family room. She was wearing a night gown and carrying a robe. She motioned me to come to her. She held out the robe without saying anything to me. I asked if she wanted me to help her put on her robe. She nodded. I held the robe so that she could put one arm after the other into the sleeves and pulled it up around her. Then I said, “I am glad that I can help you.” She gave me a hug. I told her I loved her. Then I told her I was going to listen to my music a little longer. She then went to bed. This is just one other occasion when she is childlike. I mean by that that she seems to completely look to me for help or guidance as to what she should do without asserting her independence. As always, this is bitter sweet. I know this is moving us another step closer to the future, but she is so sweet when she does things like this.